We’re wrapping up our Modern Lake House Project with the last webisode! Tomorrow we’ll give you a photo tour and then it’s all over! We’ve loved this project, so we’re going through each photo tour in this post, to make sure you don’t miss a thing! The very first webisode covers the exterior, entry, dining, living room, kitchen, and kitchen nook. We used a stone material in the entrance that was just beautiful. We juxtaposed the texture of the stone with clean, white walls and natural wood beams. 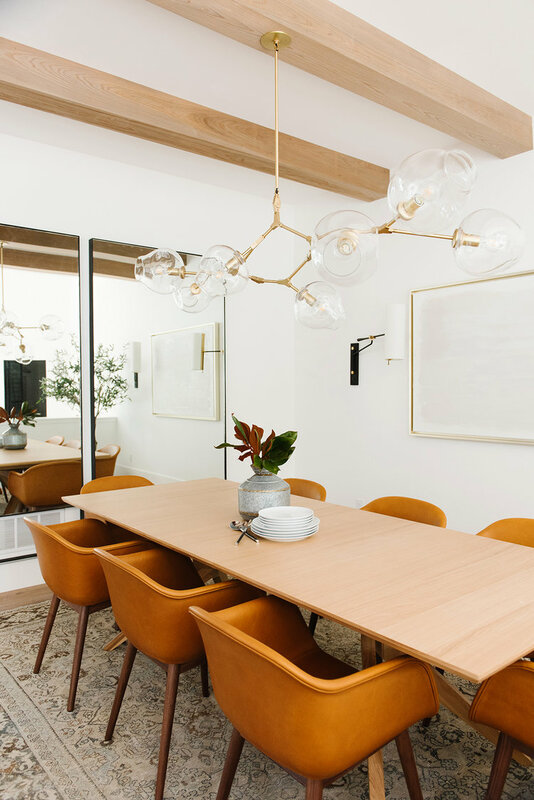 We filled the dining room with natural textures, modern statements, and a restrained color palette. Tour the exterior, entry, and dining here! We toured the kitchen and kitchen nook together. This space is full of light, and so dreamy. Our clients wanted an all white kitchen, which felt perfect for the open areas. We brought in dimension with beautiful marble and vertical paneling. It’s impossible to ignore the light flooding into the living room. The beautiful wooden beams on the ceiling and the natural stone that carries up and over the fireplace isn’t bad either. Our second webisode covers the Bedroom Wing. Now, Enjoy the first wing of the house — the master suite, office, powder bath, guest suite, and mudroom. Tour the whole wing here.